Gas-fired power plants produce about half as much CO2 as coal-fired plants. So that makes natural gas good for the environment. Shutting down coal-fired generators and replacing them with gas-fired plants would cut down on CO2 emissions and reduce global warming. we need to add in the effect of leakage. Depending on how much leaks out, the net contribution of gas to global warming could actually be higher than coal. So how much does leak out? Joe Romm rounds up the estimates here, which range from about 2% to upwards of 7%. (See updates below.) That’s a pretty wide range, and it turns out, a pretty important one. A new study from the National Center for Atmospheric Research (NCAR), which accounts for both leakage of raw methane as well as the CO2 it generates when it’s burned, concludes that replacing coal plants with gas-fired plants probably won’t have much effect on climate change. The chart on the right displays the grim news. In the best case, if leakage is 2.5%, global warming would be reduced 0.08°C by the end of the century. That’s less then a tenth of a degree. If leakage is 5%, warming is reduced by only 0.03°C. Anything above that and the net effect is actually negative. But even the best case is barely even noticeable compared to current estimates of warming by 2100, which range from 3°C to 6°C. Bottom line: natural gas is certainly cleaner than coal when it comes to particulates, mercury, and other sources of air pollution. But on the global warming front, its impact is slight at best. Until and unless carbon capture technology becomes genuinely feasible, the reality is that if we want to get serious about climate change, we need to eventually wean ourselves off fossil fuels almost completely. UPDATE: An atmospheric chemist at an environmental NGO emails to make a couple of opposing points. 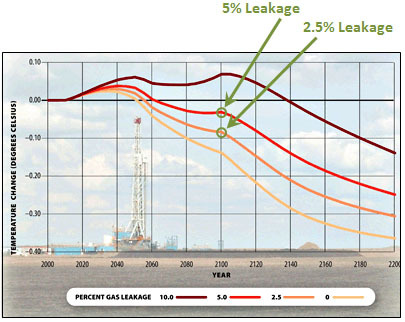 First, methane leakage is most likely at the low end of the range I quoted. The high-end 7% estimate is based on a paper so bad he calls it “deceitful.” What’s more, methane leakage is something that can be addressed pretty effectively if the EPA gets its act together. Second, one of the reasons that the NCAR study shows a small effect of switching away from coal is because the benefit of the reduced CO2 is offset by reduced emissions of SO2, which currently slows global warming because it acts as a coolant. However, sulfate particulate matter is deadly to breathe, and it’s going away regardless of whether or not we switch away from coal. It’s already on its way out in the U.S. and Europe, and starting to go away in China too. So SO2 reductions shouldn’t be counted as a cost of switching from coal to gas. If you do the modeling without that, the switch from coal to gas has a bigger effect. I can’t referee this immediately, but it seemed important to at least make a note of this dissenting opinion. If I learn more, I’ll let you know. UPDATE 2: CFR’s Michael Levi agrees that the NCAR study is “badly flawed.” I think I accept that at this point. The benefits of converting from coal to gas may be lower than industry cheerleaders would have us believe, but it’s probably more worthwhile than the NCAR study suggests.